​Viveza crashes Affinity Photo as soon as you add a Control Point. ​ReMask gives a message about unlocking transparency first so I need to investigate that more. ​Please feel free to add any plugins you get working to this list. I've put a list here for the Mac version. I believe most plug-ins will behave the same in Photo Beta for Windows but i'm still checking this out with the latest Photo Beta for Mac and Windows. Thanks Mike, that's very useful! I think we are going to compile a list of all the compatible plugins eventually so if we can make sure these make it on the list. @MEB Ah I haven't seen that list before. I think it would be an idea if we had a sticky with a list of all the known working plugins. Currently the implementations are quite different, but they will be largely similar. Overtime we will bring the two platforms closer together in their support for plugins. ​That still leaves ReMask, so I need to look at unlocking transparency, whatever that is. PTLens from ePaperPress doesn't work. Affinity crashes when I start the plugin. Is there anything specific I need to do to actually get the plugins reported to work to do so? All of my PS plugins are showing, but with the welcome-screen images, selecting them has no apparent effect (this also goes for ones explicitly reported as working, such as Nik Color Efex Pro), and with an image of my own (16 bit TIFF), all of the plugins are greyed-out in the menu. My system is x64 Windows 10 Pro, in case that's relevant. do you have in plan to implement as much as possible of this plug-ins as native Photo features, so that there would be no need of them? Link doesn't work - "backend not available"
Sharpener Pro looks like it works ie the window opens, but for me that is as far as it goes. I get the same message from Remask 5. You need to switch to 8 bit working using Document, Colour Format, RGB (8 bit). Also check that in Preferences you have ticked the box "Allow unknown plugins to be used"
When instaling a new beta or final version, are all paths to plug-ins and installed brushes... preserved or we need to reinstall them after any new version? Can someone please tell me how to use Topaz Labs with Affinity Photo? You should be able to access them by: Edit>Preferences>Photoshop Plugins and pointing to the folder where your plugins are currently installed, assuming they're not in the default location. 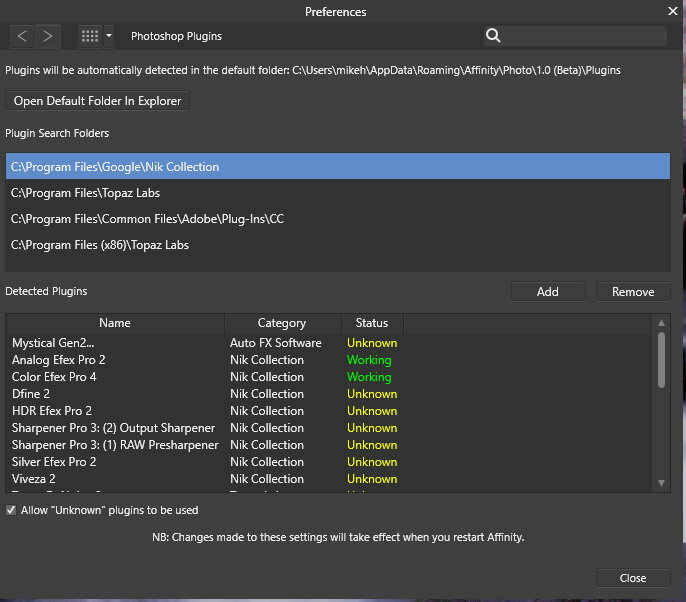 I did all of this and they show up in my filters panels, but do not open the plugin when i click on them. I have the allow unknown tab checked also. You will need to copy the actual plugin files from the "C:\Program Files (x86)\Topaz Labs\ <filter name> \Plugins_x64" and ""C:\Program Files\Topaz Labs\ <filter name> \Plugins_x64" directories to the "%appdata%\Affinity\Photo\1.0 (Beta)\Plugins" directory as Topaz Labs uses links in the PS directories. Add the Topaz root folder (C:\Program Files (x86)\Topaz Labs\) to the plugin list in AFPhoto. Looking a this old post, I guess it's best to close it. It's outdated and proper list is kept on company website. Anyone get noise ninja plugin to work? If so how did you manage it? There's no way to save or export files from Develop Persona. It's just a first step taken before moving the file to Photo Persona where you can effectively save or export the file. Affinity Photo doesn't work like other DMA's (it's not a DAM itself) where all changes made to the RAW file are kept as XMP sidecar files (or DNG). The edits you perform in Develop Persona are "baked" to the file when switching to Photo Persona and cannot be reversed/edited. It's a similar workflow to open a file in Camera RAW (in Photoshop) and them move to Photoshop for further editing, saving the file as a PSD in the end. afphoto files weren't intended to be used for storage. They were developed with performance in mind and so include additional data to help speed up app's responsiveness when managing large files. We have plans to develop our own DAM application later. thank you for your fast reaction. I am not worried about a DAM, I use ACDSee as DAM. I am more concerned about a non-destructive workflow. As the edits I perform in the develop persona are "baked" into the file, I cannot go back and change them at a later time, I would have to start from scratch. That sets Affinity Photo apart from the likes of ACDSee Ultimate or On1 Photo 2017 that save all the edits of the develop mode into an XMP file before you step to the edit mode. I don't like it, but I could get used to it. Back to the topic of the thread, plug-ins. I understand that the DxO Viewpoint plug-in is too intimately connected to PS to ever work in Affinity. But there could be an easy solution to this "problem" if the standalone version of Viewpoint could be "called" directly from Affinity's export dialogue with a function like "export as ... and open with ..." Raw Therapee and DxO Optics Pro have that functionality. Kind of related… https://support.google.com/nikcollection/answer/3000889?ref_topic=3000839"The Nik Collection is free and compatible with Mac OS X 10.7 through 10.10; Windows Vista, 7, 8; and Adobe Photoshop through CC 2015. We have no plans to update the Collection or add new features over time." It seems that Google are preparing to let the much loved Nik Collection wither and die. Even if Serif get's AP to work effectively as plugins with the Nik Collection, the latter will eventually just sink. Sad. What chance Serif, Adobe, Silkypix, Macphun, Phase One, ON1 or whoever buying up the rights to Nik Collection / patented technology? Engineering control point technology into one of the aforementioned RAW converters would be almost a certified sure fire winner. Quick return on investment.